Hollybeary Creations : Happy Birthday Newton!! Happy Friday everyone... It's time for the Newton's Nook 4 Year Anniversary Blog Hop!!! Come join the Design Team and some special guest as we highlight the July Release. We have Prizes too... We will be giving away four $25 GC to the store. My hop project features the Fun new Set Winston's Lake House and it's Coordinating Dies. I also used the new Waves Stencil in my background and the trees from the new Lake Advice Stamp Set. I started out by water coloring some Salty Ocean Distress Oxide Ink onto a piece of Bristol cardstock through the Waves Stencil. You want to keep your ink more on the dry side so you don't have any seep under the stencil. This created a resist effect. Then I added some Tumbled Glass and Mermaid Lagoon Distress Ink over the stenciled waves. (The Distress Oxide Inks didn't blend when I added the regular Distress inks over them) Then I added some Vintage Photo Distress Oxide Ink to create a River's Edge. I smooshed the ink onto the mat and used a paintbrush. Once that was dry I added some Squeezed Lemonade Distress ink to the upper portion to create a Sky. Then I die cut the panel with a Wonky Stitched die. 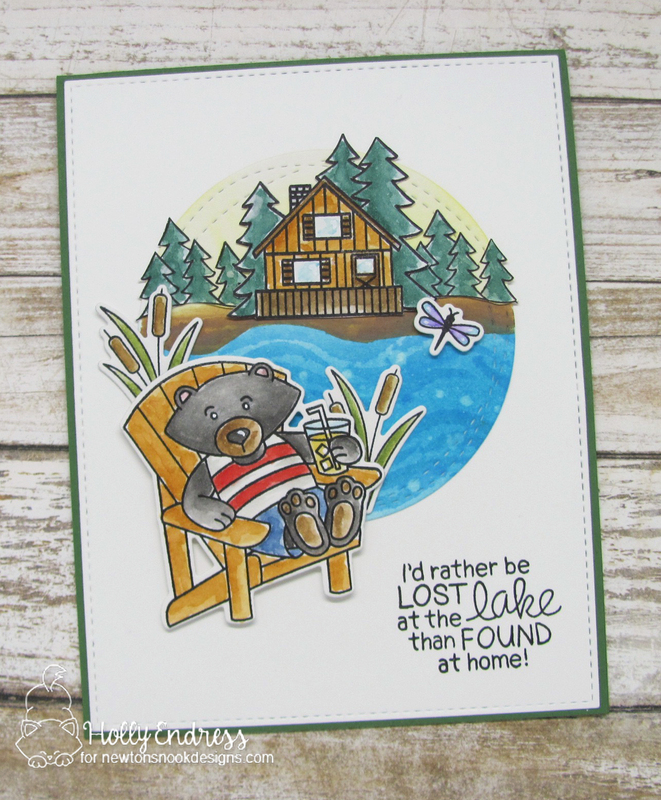 I stamped the images from Winston's Lake House and Lake Advice onto some Bristol cardstock and then I colored the image sin with Distress Inks. once the images were dry I added some water splatters to everything but Winston and dabbed the excess with some paper towels. I die cut a White card panel and added it to a Green card base. Then I stamped the sentiment in the lower corner with some Black ink. I adhered the circle piece to the card front and then I added the lake house other images directly onto the panel. I adhered Winston with some foam tape along with the dragonfly. I really like how these two sets paired up and the addition of the Stencil for some texture. Celebrate with us and enter to win! To celebrate 4 years Newton's Nook Designs is giving away a $25 store credit to spend in their online shop to 4 lucky winners! Comment on the NND Design Team and Special Guest blogs (see list below)! The winner will be chosen at random from the collective blog hop posts. Make sure to check out each of their blogs and comment for your chance to win. You will not know which blog has been chosen so the more you comment on the better your chances are of winning! You have until Sunday, July 16th at 9pm CDT to comment. Winners will be announced on NND blog post on Monday, July 17th and will need to contact us to claim their prize so make sure you check back to see if you've won! This is the perfect summer card! I love how cute he looks at the lake! Great coloring technique too! That's such a beautiful card. Little Winston looks quite relaxed beside that lake. Great card. I am envious of Winston right now. Can I please be lost at the lake with Winston? With a glass of lemonade? :D You created a great scene there. Wonderful card. I love how you focused your scene within the circular area. Very cool! I totally want to hang out with Winston at this lake! What a fun card. Thanks for all the inspiration this week, Holly! Fabulous card! Love the loose watercoloring! That is where I wish I was right now. Love to be kicked back at the lake. 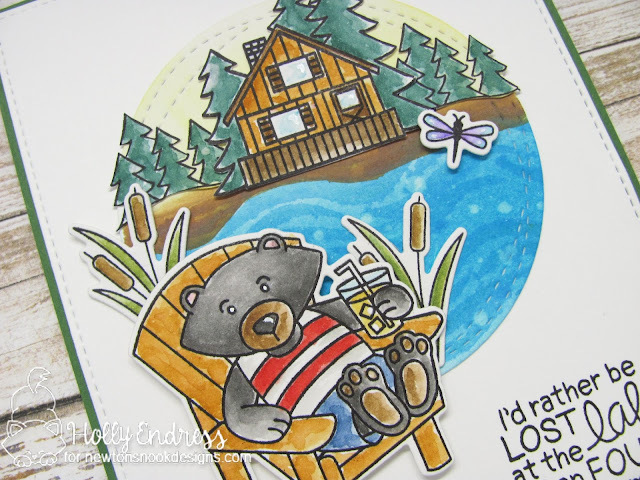 Adorable relaxing Winston...great use of the distress inks. Great design and your coloring looks fantastic. Aww! This is so sweet! I love the little scene contained in the circle with Winston in the foreground! Super fun! Thank you so much for helping to celebrate our Anniversary today! What a cool cool design, it makes me feel like I need to get-away for a little relaxing time too! Great watercolours, such a cool card! What an adorable scene. Wonderful coloring. Love your lakeside cabin scene! Great coloring! Happy 4th birthday to Newton's Nook! Enjoying the hop! Eautiful card! This stamp will be perfect for so many of my friends and family! Cute scene and great coloring. Love your scene, makes me wish I was there!!! What a great card. Thanks for sharing your design. What a charming and sweet scene!! Thanks for explaining how you created it. Very relaxing Lake scene you created. Hahaha!Fantastic sentiment!Lovely scene!Thank you for the inspiration! Wow, your card is amazing! I really like this beautiful and peacefully scene that you create. You used very meaningful sentiment. Love it! Hugs from Slovenia! Totally need this set. Lake take me away! Adorable, this reminds me of the lakes near my house! Also, we have lots of pesky bears around here, but they aren't as cute as this one. I love the coloring and the cute little dragonfly is my favorite. This is really cute. I'd love to go join him there by the lake! I especially like the way you used the circle to contain the house scene. This card looks fabulous! I only wish I could hang out next to Winston at his beautiful lake house! The scene looks so relaxing. Really lovely card. You created a great little scene. That Winston looks pretty cozy sittin' by the lake drinkin' his sweet tea! lol Awesome card. Love this card and this looks likea grwat stamp set to have! Very cute and relaxing scene for Winston to rest at!